Italian Switchblade Stiletto Knife with an imitation carbon fiber handle overall open length 9 Inches with a Black Dagger Blade by Frank Beltrame with FRANK B ITALY stamped on the blade. This Italian Switchblade Stiletto is made in Maniago, Italy by AKC Knives and comes with white acrylic pearlex handle. 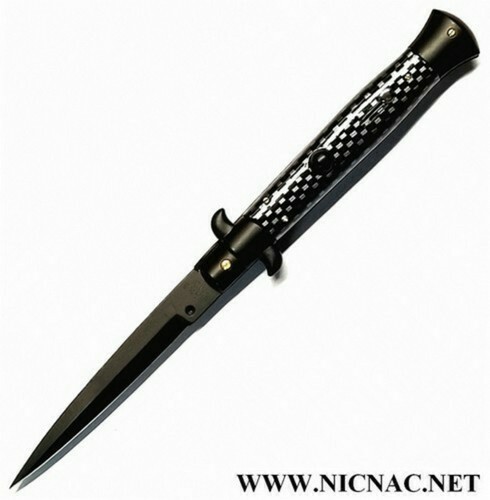 It is approximately 9 inches in overall open length (true length 8 3/4) with a 4 inch blade (cutting edge of 3 1/4 inches). Closed this Italian knife is just under 5 inches. It closes with a swivel bolster and comes with a bayonet stiletto style blade. It also has soldid brass liners and pins and has a polished stainless steel blade. Just below the push button to open is a slide safety button. The blade is stamped "AKC Italy".